One year after the PIAAC data were released, the adult education and training field finds itself in a transformed environment with unprecedented visibility. In a single week in July, the Workforce Innovation and Opportunity Act (WIOA) was signed into law and Vice President Biden’s Ready to Work: Job-Driven Training and American Opportunity report was released. The President gave a speech emphasizing the need to train more Americans for 21st century jobs. And finally, the White House blog featured an article, co-authored by the Director of the National Economic Council, Jeffrey Zients, and the Secretary of Education, Arne Duncan, on how the Administration is working to “upskill” more Americans, specifically drawing on PIAAC data identifying the 24 million low-skilled working adults. Between the time of PIAAC’s release in October 2013 and this busy week in July, the data commanded attention. The stark, but undeniably credible findings and clear global comparisons provided tremendous gravitas to underscore the urgency of bold action and galvanize a wide cross-section of stakeholders. Looking back, it is clear that the compelling data fueled an all-out effort to build awareness of the wide-ranging impact of low skills in our communities. Advocates and stakeholders from around the country committed to support an engagement strategy that took OCTAE leadership across the country for regional Time to Reskill summits. An online toolkit was posted that local areas used to host events and send in feedback. Roundtables were held with focused stakeholder groups to seek input and commitments. The research community was engaged to undertake new analyses and surface more nuanced findings. Congress took notice and reached consensus on new legislation. The White House undertook a thorough review of federal job-training programs. Public, philanthropic, and private-sector entities pledged action. A national action plan was previewed at the annual meeting of state directors of adult education. Looking ahead, we need to continue to work together toward the transformation that these new developments make possible. The U.S. Department of Education will work toward a robust implementation of WIOA that capitalizes on the significant opportunities the law represents for adult learners and job seekers. We will work with the National Economic Council, stakeholders, and employers to implement the actions pledged in the Ready to Work report to ensure that low-skilled workers have ample opportunities to learn and advance. In 10 years, when the next PIAAC dataset is released, we are confident that we will see real and lasting progress in this country to address the achievement gap and upskill more Americans for the 21st century global economy. Education at a Glance (EAG) 2014 was published by the Organization for Economic Cooperation and Development (OECD) in September. EAG is an annual publication that is the authoritative source for accurate and relevant information on the state of education around the world. It includes data on the structure, finances, and performance of education systems in OECD member and partner countries. The EAG 2014 report contains data from PIAAC 2012 on educational attainment, employment, intergenerational education mobility, earnings, and social outcomes and how these factors relate to skills proficiency. The report can be found here: http://www.oecd.org/edu/Education-at-a-Glance-2014.pdf. Some results from PIAAC are also highlighted in a webinar presentation of EAG 2014 results by Andreas Schleicher, Director of the OECD Directorate for Education and Skills, that can be found here. WIOA focuses more sharply than its predecessor (the Workforce Investment Act of 1998) on demand-driven strategies that unify adult education and workforce programs to build integrated skill programs and career pathways that create stepping-stones to better jobs. Watch an archived overview of WIOA here. Ready to Work recommends a focus on three critical areas: (1) bringing 3 million long-term unemployed adults back into the U.S. workforce; (2) helping 24 million low-wage, low-skilled U.S. adults to “upskill’ into better jobs; and (3) finding new ways to train more Americans for more than half a million jobs unfilled today in IT occupations. SOURCE: U.S. Department of Education, National Center for Education Statistics, Organization for Economic Cooperation and Development (OECD), Program for the International Assessment of Adult Competencies (PIAAC), 2012. The PIAAC data can also be helpful in thinking about how to most effectively implement the WIOA and Ready to Work initiatives. This was the impetus behind a recent presentation on PIAAC in Chicago. We brought PIAAC to Chicago on September 15 and 16 to present an overview of and key findings from the survey and lead a discussion focused on why adult education matters. Sponsored by the Lloyd A. Fry Foundation and jointly hosted by the Chicago Chapter of the Literacy Funders Network and the Chicago Citywide Literacy Coalition, the event was an opportunity for Chicago literacy and workforce leaders concerned with implementing the new initiatives to find out what PIAAC tells us about the importance of building a strong foundation of literacy and numeracy skills to the success of efforts to upskill America. level and distribution of numeracy skills within and across subpopulations in the U.S. Her presentation was followed by a panel moderated by Whitney Smith, Employment Program Director at the Joyce Foundation. The Joyce Foundation has been at the forefront of initiatives focused on integrating adult literacy into career pathways that can lead to better jobs (see http://www.joycefdn.org/programs/employment/basic-foundational-skills/), and Whitney launched the panel’s response to the presentation by focusing on how the data seem to demand new vehicles for addressing literacy and numeracy, since so many low-skilled adults in the U.S. are working and unable to participate in existing adult education programs. She highlighted the need for more employers to become involved in these efforts and for the U.S. to build on efforts like Digital Promise to develop effective new online learning opportunities for working adults. Bob Paponetti, Executive Director of the Literacy Cooperative of Greater Cleveland, Ohio, spoke about how his agency had brought PIAAC to Cleveland to highlight the low skills in the community and the need for concerted action by local stakeholders. One of the new initiatives in Cleveland is a skills development program at University Hospital that is open to workers in all jobs and at every skill level, not just the most highly skilled workers. Becky Raymond, Executive Director of the Chicago Citywide Literacy Coalition, closed out the panel, talking about the work of the coalition and inviting members of the audience—which included representatives of local foundations, policymakers, and practitioners—to share their thoughts. PIAAC had helped to engender a lively discussion—and a renewed commitment to find new ways to use the combined resources of the participating organizations to help more adults with low skills in the Chicago area to skill up and have a chance to move up to the middle class. PIAAC will soon be launching its Outreach Toolkit, which includes slide presentations that presenters can use to share information about PIAAC with their community. The Toolkit will include PowerPoint modules that focus on key issues, including low-skilled workers, the future workforce, the role of parents’ education, and literacy skills and health status. Check the PIAAC Gateway for information on when the Toolkit will be available. Funded by the Institute of Museum and Library Services (IMLS), Portland State University and Oregon’s Multnomah County Library system will collaborate on a 2-year research project to improve library practices, programs, and services for adult patrons—especially economically vulnerable and socially isolated adults, seniors, English language learners, and others lacking basic digital literacy skills. This project will provide the opportunity to administer PIAAC’s Problem Solving in Technology-Rich Environments (PSTRE) assessment. Multnomah County Library and other public library systems are uniquely positioned to tailor services to the varied needs of adult learners; however, they have not to date been a prominent part of PIAAC development and analysis. Through its partnership between university researchers and Multnomah County Library, this project will address this crucial need, consistent with the IMLS strategic goal for placing the learner at the center and supporting engaging experiences in libraries that prepare people to be full participants in their communities and a global society. This research project’s use of the PSTRE assessment will provide the library with a much more nuanced perspective on adult patrons’ digital literacy skills and needs. The protocols and procedures that are developed will serve as a guide for building other patron surveys around the PSTRE. Conducting such surveys will aid libraries nationally in responding to the growing needs within their communities to help vulnerable adult populations bridge the digital divide. Administering the PSTRE, and reflecting on what the results mean for library patrons, will invite libraries into the national and international conversations taking place among policymakers, educators, and community organizations about the PIAAC data and position them to design better and more data-driven lifelong learning opportunities. For more information, contact project coordinator Drew Pizzolato at apizzola@pdx.edu. The National Center for Education Statistics (NCES) has developed an online PIAAC training package that includes modules with detailed information on (1) PIAAC direct assessment domains, (2) background questionnaire, (2) data collection process, (3) assessment and sampling design, (5) dataset structure, and (6) how to use the PIAAC data tools, including the International Data explorer (IDE) and International Database Analyzer (IDB). The information and resources will assist researchers in conducting studies based on the PIAAC data as well as non-researchers who simply want to know more about PIAAC. Look for the PIAAC Data Training modules on the NCES website in the next issue of The PIAAC Buzz! 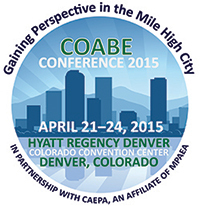 COABE 2015 Call for Presentations (due Nov 15) and PIAAC Strand! Interested in submitting a proposal for the 2015 Commission on Adult Basic Education (COABE) conference? Don't forget to submit your proposal by November 15, 2014. Click here to find more information. If you are planning on attending the conference, look for the PIAAC strand that will include an overview of PIAAC, several sessions featuring research papers based on PIAAC data, and a full session on cross-cutting implications of PIAAC based on research paper results for policy, programs, and future research! Two news articles have been posted to the PIAAC Gateway since the last issue of The PIAAC Buzz. A New York Times article published on September 10, 2014 “A Simple Equation: More Education More Income,” by Eduardo Porter, looks at issues of income and education inequality in the U.S. Porter argues that education can be the key to fighting inequality in this country, if we address the fact that education itself is a system riddled with inequality. While the U.S. was one of the first member countries in the Organization for Economic Cooperation and Development (OECD) to offer public education, younger U.S. adults are not keeping up with their peers in other developed countries in achieving a higher level of education than their parents. In addition, more U.S. adults are finding themselves without a college degree and, as a result, without the wage premium that a college degree brings. Porter believes three factors contribute to these problems. The first is that the rising cost of a college education has made going to college riskier, especially for low-income families. Second, as a nation, our education system has not adequately prepared underprivileged Americans for college. The third factor is that Americans have lost faith in what Porter describes as “a national project”—the idea that it is important to the well-being of all of us to invest more tax dollars in “a broad effort to fund higher education for all.” Confounding the issue is the growing gap between the rich and poor that exacerbates inequalities between school districts in wealthy areas and in poor areas and that is leading to a disinvestment in public education among wealthy Americans who can afford to opt out. The PIAAC data can shed light on these issues, helping us explore relationships between the earnings, basic skills, and educational attainment of adults and their parents in the U.S. You can find the New York Times article on the PIAAC Gateway here. The second article, “Long-Term Strategy on Adult Skills Needs Political Will… and This Has Been Lacking,” by Mary Hamilton, published in The Conversation on September 12, 2014 challenges the British government to take action on building adults’ literacy and numeracy skills in response to England’s results on PIAAC. One step in this direction is a report from the Business Innovation and Skills Select Committee. It recommends that the government launch a campaign to deal with issues of low levels of adult literacy and numeracy. Read the article here. The data collection for the PIAAC National Supplement ended in June 2014. The data collection focused on (1) incarcerated adults, (2) unemployed adults, (3) young adults (ages 16–34), and (4) older adults (ages 66–75). We are now cleaning the data and making plans to analyze the data and prepare reports. We estimate that the data will be available to the public in 2016. The PIAAC Q&A is now available on the Gateway. In the new PIAAC Q&A, you will find answers to technical and nontechnical questions across the following topics: data analysis, data files, data availability, and derived variables and indices. Which items comprise the “Readiness to Learn” derived index in the PIAAC dataset? You will find the answer to this question and others here: http://piaacgateway.com/your-questions-our-answers/. Do you have a question about PIAAC? You can submit your questions through the form available on the Q&A page, and a PIAAC expert will get back to you as soon as possible. This page will continue to be updated with the answers to new questions as they come in, so please check back often! A number of videos about PIAAC have been posted on the PIAAC Gateway. The topics range from an overview of key findings in the U.S. to a policy talk about PIAAC and its implication for economic research and policy. Below are examples of the videos you will find on the Gateway. Post information about PIAAC on the websites, blogs, and discussion lists. Let us know if you have an upcoming conference and would like us to present at your conference. On September 8, the Center for Universal Education at the Brookings Institution hosted an event in honor of International Literacy Day called “Not Your Grandfather’s Literacy: Scaling Higher-Order Skills for the 21st Century.” The discussion was focused on the changing world that young people are growing up in and the skills and literacies they will need to thrive in it. The panelists presented a variety of perspectives on 21st century learning and drew from examples in the U.S. and internationally. One of the panelists, Amanda Ripley, used the PIAAC results to illustrate the dramatic progress that some countries have made over a fairly short period of time. She also discussed the international rankings of older Americans and younger Americans and noted that older Americans do comparatively well internationally, while younger adults do not. She suggested that it was important to look at the trajectory of the countries that have made progress and see what steps they have taken to make improvements. To learn more about this event, go to http://www.brookings.edu/events/2014/09/08-literacy-skills. There are links there that will allow you to listen to an audio recording, or read a transcript, of the event.